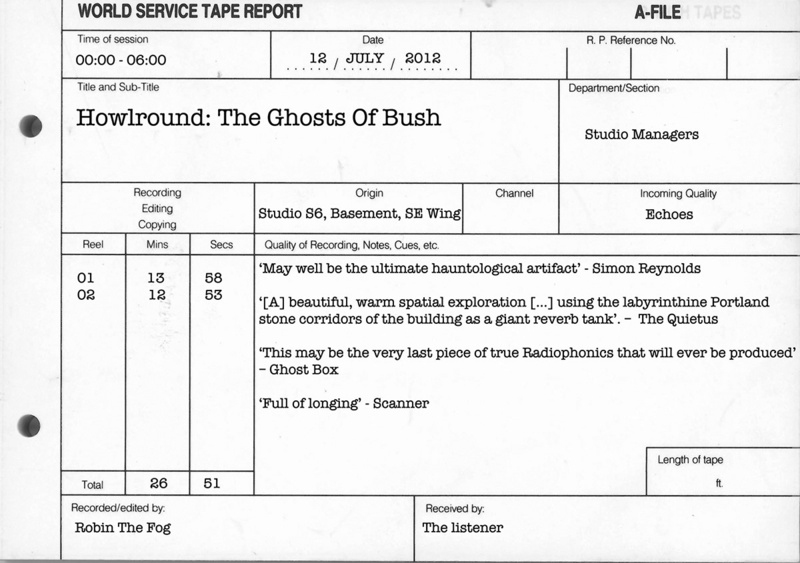 Ghosts of Bush is a recording by Robin The Fog (under the name Howlround) which documents the last days of Bush House, the once home to that broadcasting stalwart the World Service. It is a kind of indoors field recording which was captured late at night in the empty rooms and corridors of the building. Part of that layering process, how the recording was made, comes about by a literal layering of sound. 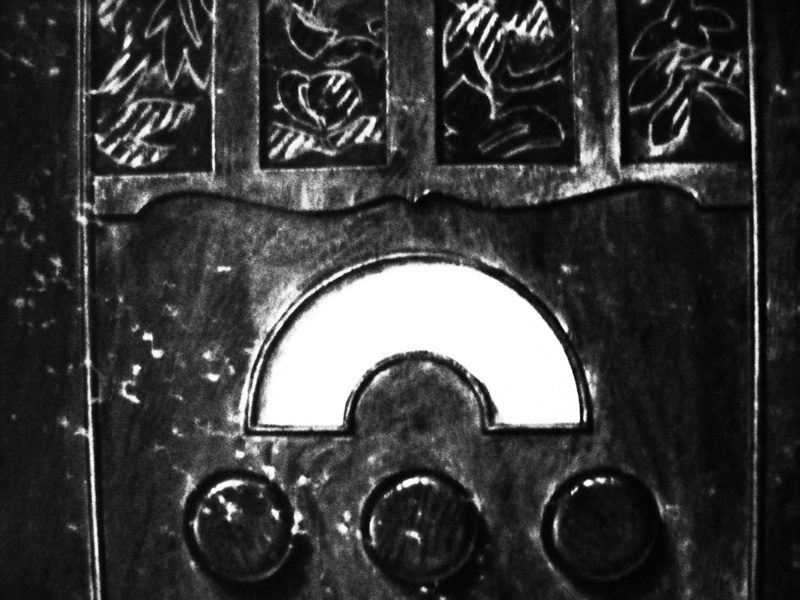 The record was created using purely analogue equipment, via tape loops and so on which utilised some of the last remaining of such machines in Bush House. 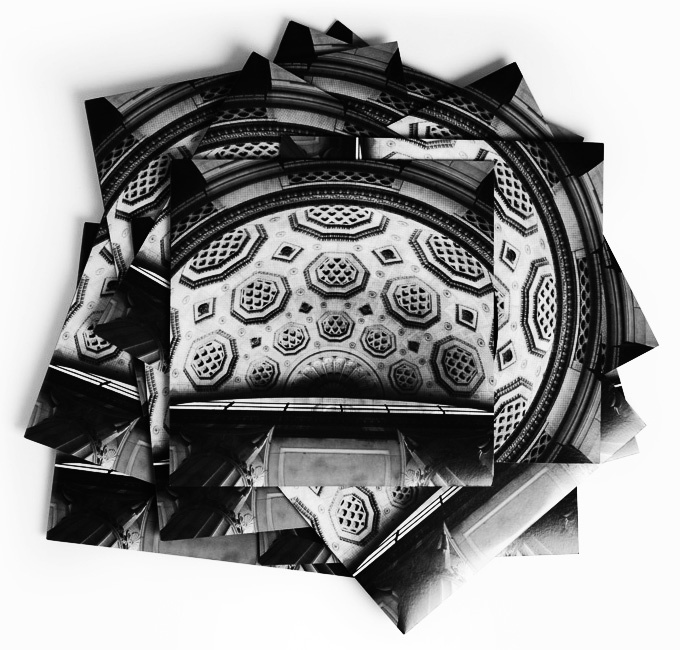 This process feels like an important, intrinsic part of the work, a way of reflecting and capturing the spirit and history of the building, the institution and its technological stories and legacy. When I listen to Ghosts of Bush I often think of the distant howls of long-lost and departed creatures, huge as dinosaurs. Which in these days of almost ubiquitous free market culture, may well be kind of appropriate as Bush House was responsible for transmissions from that possibly endangered philosophical idea, publicly owned broadcasting. “These are the sounds the building makes when it thinks no-one is listening, the sounds of many sleepless nights spent isolated in a labyrinthine basement surrounding by a crepuscular soundtrack of creaks and crackles. It’s an attempted homage to the work of the BBC Radiophonic Workshop who crafted the most incredible of sound-worlds from the most basic of sources. But mostly it’s my way of saying goodbye to a building that I and so many people have loved. Which is a lovely, evocative, sad and celebratory piece of writing. Robin The Fog is a busy chap. Alongside his own releases (under various names including the aforementioned Howlround – available for appearances at your local music hostelry accompanied by their ferrous wheel sound machines) he is often to be found sending his own broadcast signals out into the world. As part of that, he helps out on Jonny Trunk’s OST show on Resonance FM (his job description would probably include manning the phones for a series of make-me-chuckle-out-loud competitions, technical assistance and affectionate bickering) and occasionally stands in for Mr Trunk. 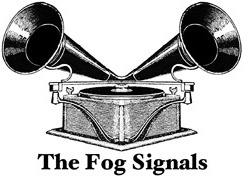 I would heartily recommend his The Foggy Record Box show from the 27th October 2010: in large part this is a joyous wander through educational records from times gone by. Some truly wonderful stuff, which for me featured some good “Ah, that’s what that is/that’s where that’s from” moments. It made me want to send off missives to all kinds of people I know who have young folk who may well appreciate such things. To quote Mr Fog it’s “fun for all the family” (although strictly speaking I probably wouldn’t let it run until the end as there is a collage piece that may have young folk checking under the beds and in the wardrobes for weeks to come). 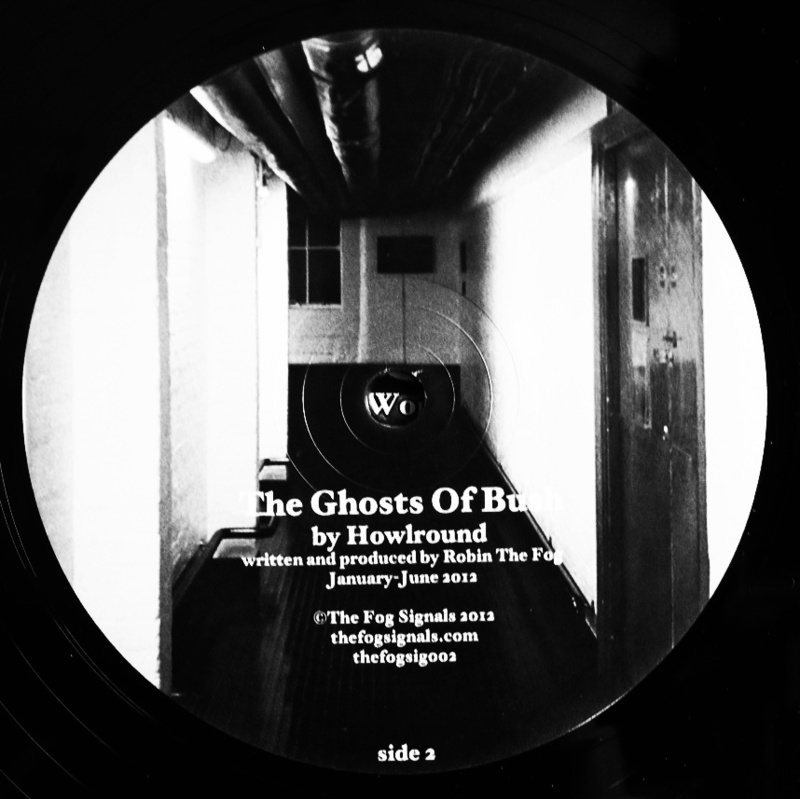 You can listen to that broadcast at Robin The Fog’s site here. Howlround can be visited here. You can listen to/purchase Ghosts Of Bush in its digital form here. You may still be able to purchase it as a white spinning disc at Boomkat here (whose writing on some of the further flung pathways of music have often been a point of reference for A Year In The Country wanderings). If you have the space for such things, the appropriate playback technology and the spare pocket-money, it’s a record that’s well worth casting a net over. And as a final note, as somebody who at this time of year has to often brave on a daily basis some slightly over attentive bovine creatures, the line “Trampled by cow is an embarrassing death” on his track “Notes On Cow Life” (accompanied by Guy J Jackson) made me smile. Listen to that here.